Just Like the Vigor AP900, this access point also extends your WIFI network but is meant to be installed and kept on table tops or mounted to the side walls of a room. There are additional ports in this access point that allows you to connect other devices in the area to be remained wired. Even though the WIFI technology is great to use, it has its own limitations. We always recommend to keep gadgets wired that use the internet heavily such as the PS4, Samsung Smart TV or your Gaming PC. The AP900 does not require a separate power adapter so it is easy to be installed and can be powered through the internet wire itself. 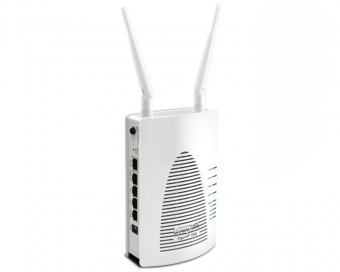 If combined with the Vigor routers, this access point can be managed from the router itself. Just like the Vigor2925ac, this router has all the capabilities of the Vigor2925ac but is meant to be installed in places that have a weak infrastructure such as old villas and old buildings. Most Engineers in the region don't have the proper knowledge of how traffic is managed between the devices in your home and you end up with slow internet even though you have full bars. Deployment is key to success, The Internet router can be connected to a POE switch such as the P1090 that allows power and internet to run on the same wire, this should be connected to the Vigor Access point that is placed in all the rooms that need the WIFI coverage. With our proper setup and configuration, you will not only have Full Bars of WIFI but Full speed as well. The evolution of technology is inevitable. The less the wires running in the home/office, the better. The Vigor access points can be powered by using just the LAN cable. The same cable will spread your internet in the room and be powered at the same time. You still have the option of connecting a power adapter if required. People who don't know much about bands are confused of the meaning of DUAL band routers. 2.4G is a radio spectrum that allows your wireless devices such as your iPhone, iPad and WIFI computers to connect to the Internet router . This spectrum is used by other devices that can cause interference such as cordless phones, remote controls and etc, that's why 5G is useful, there are very few devices that connect on this spectrum and you are bound to have less interference. The Vigor Access points have both 2.4 and 5G spectrums, the connection is based what your device is capable of connecting on.